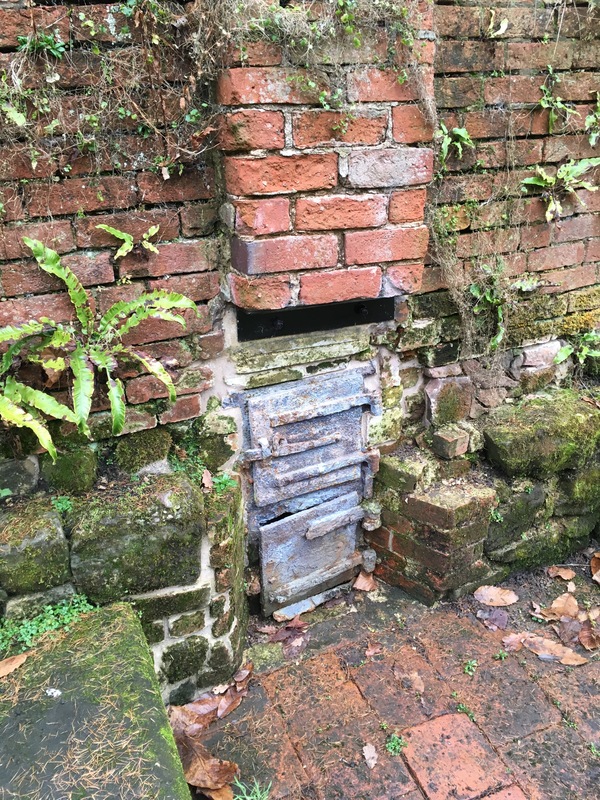 Day 20 of my #AdventCalendar for gardeners- a visit to Calke Abbey. 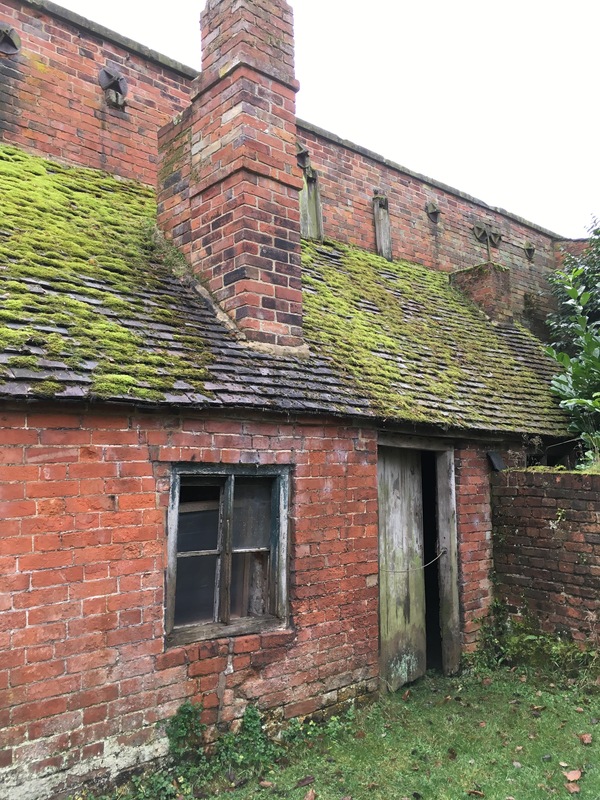 Mossy roofed potting shed in the walled garden at the national Trust’s Calke Abbey. There’s a tiny bed in there for the garden boy whose job it was to keep the greenhouse boilers stoked. 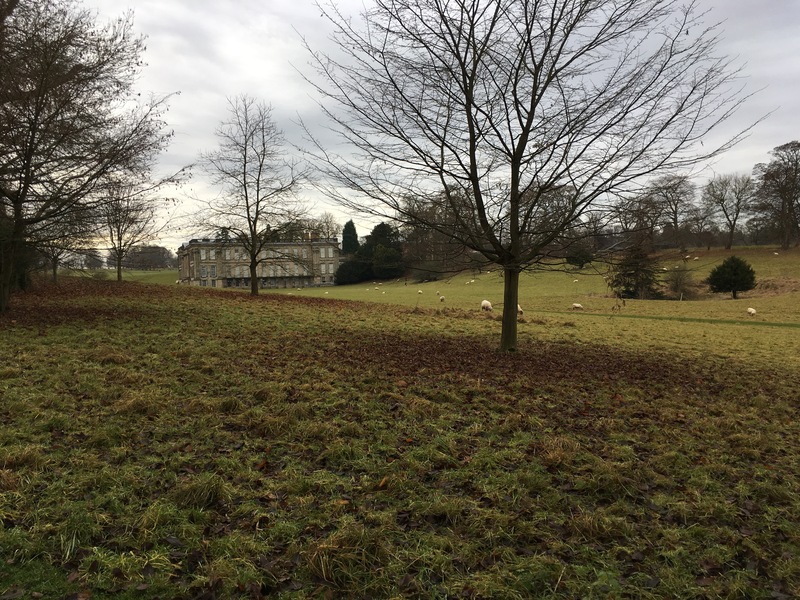 Alison and I have started a tradition to walk the gardens in the week before Christmas, and reflect on what life was like for the gardeners. Then there’s a food fair in the old riding school where we sample local honey, Leicestershire cheese, home made fudge and chocolates- and we stock up for the festive season. It’s rather a wonderful tradition to have started. 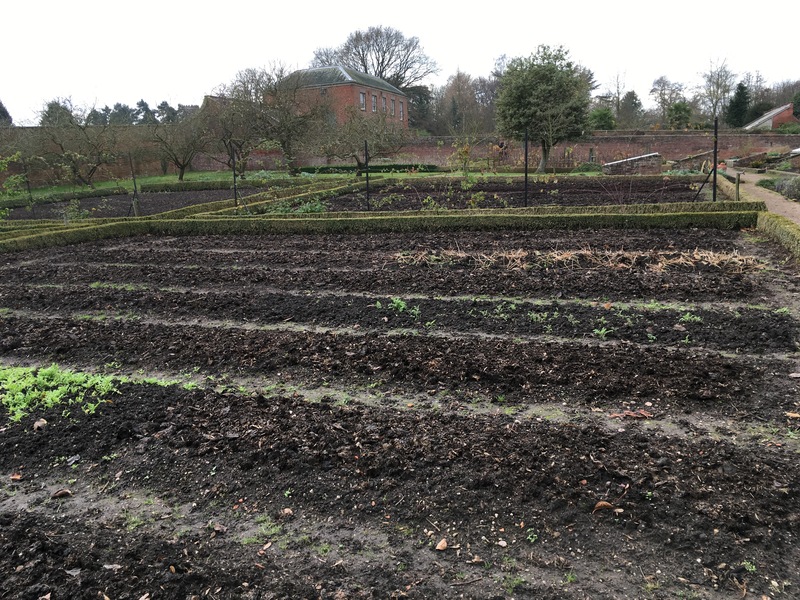 The walled kitchen garden is looking beautifully tidy. The beds are mulched and weeded. All set for the spring sowing season. Quite a cheerful sight to behold. It’s nice to find something new in a favourite- much visited garden. This area was being excavated last time we stopped by. What treasures were under the mounds of earth, we wondered. 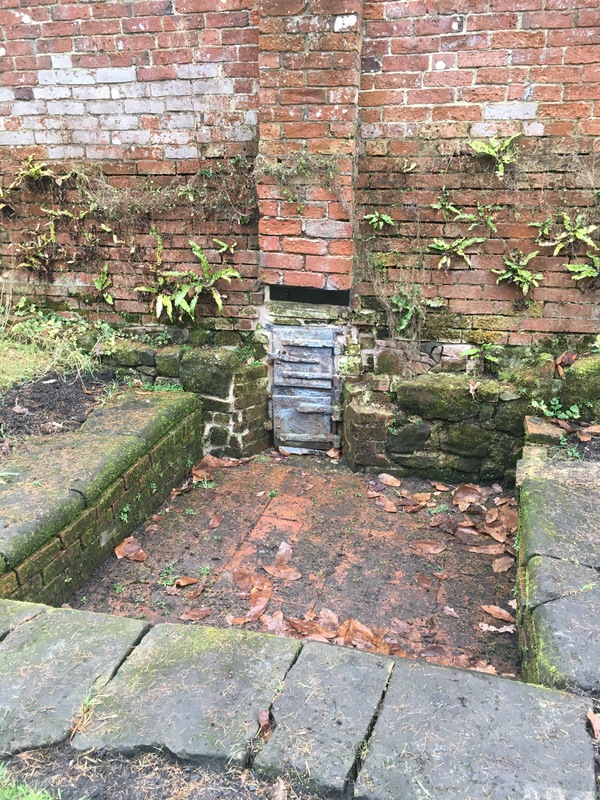 It looks like a boiler for the hypocaust heated wall. Isn’t it amazing it’s still here. And the beautiful brick floor is still intact. We mooched in the peach house. I think this blue paint is my all-time favourite colour. I’d love to paint my potting shed the same hue. It reminds me of the Mediterranean. 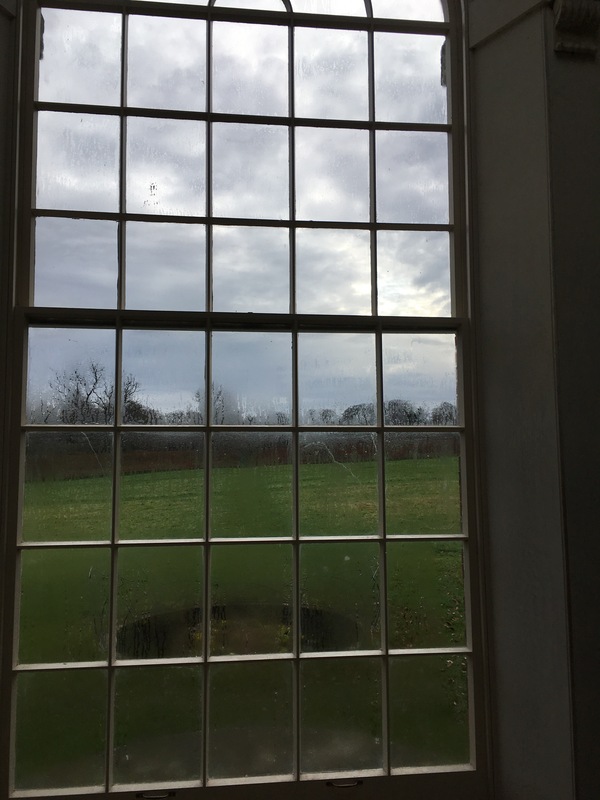 We peered through the misty peach house windows. In the summer these open right up. There are deckchairs to sit and gaze at the wild flowers and waist high grass. View of the peach house /orangery from the church. We spotted these glorious giant white-painted cloches. And coveted them! 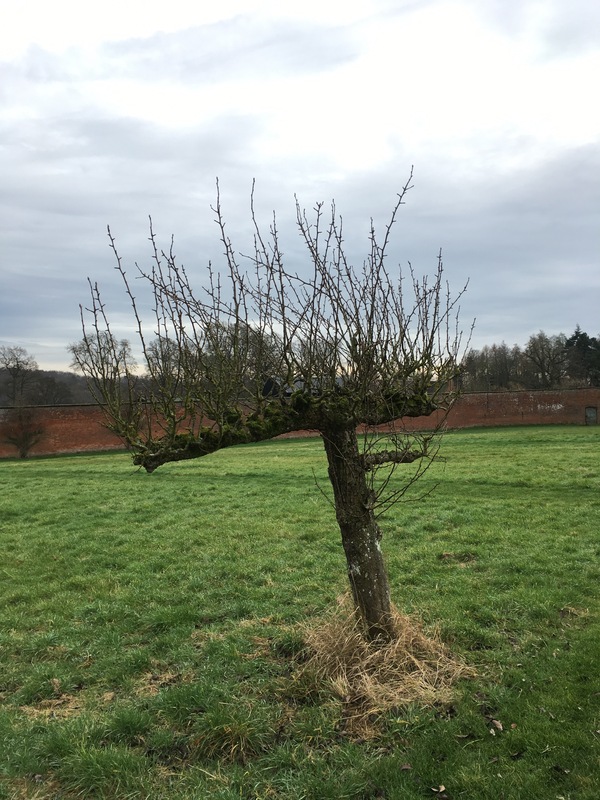 A few ancient espalier fruit trees remain in the walled garden. We love their mossy-covered boughs. 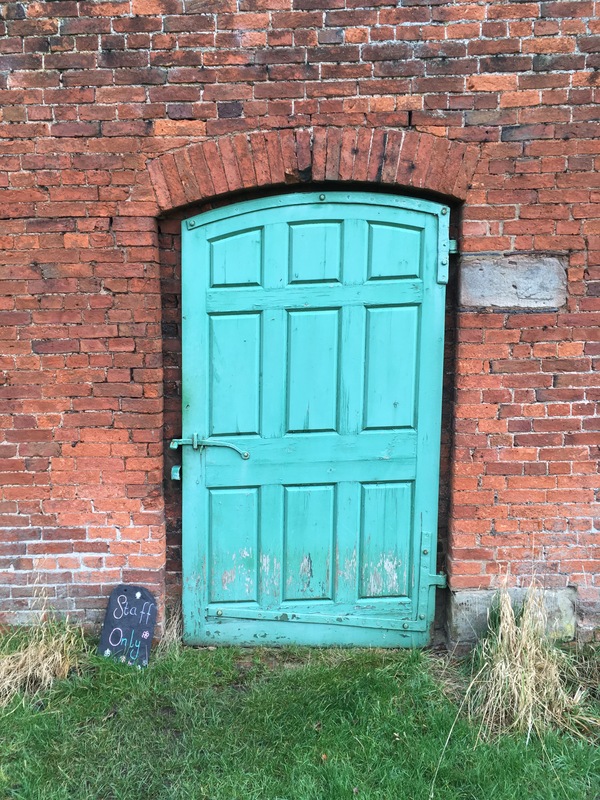 We hadn’t noticed this door in the walled garden before. In summer there’s so much to see. But in winter, we notice the bare bones of the garden and home in on wonderful details like this. We’ve never seen the sheep grazing right to the house before. We like this seasonal change. The sheep set a scene that could easily grace any Christmas card. We just need some snow to complete the picture. 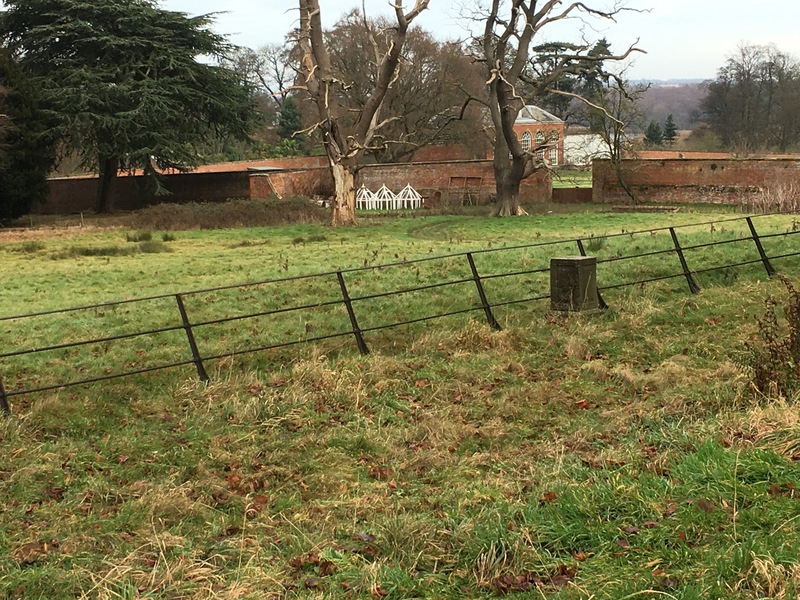 I hope you’ve enjoyed my tour of Calke Abbey and the kitchen gardens. Do you have a garden that you love to visit as often as you can? Do you find new treasures each time you visit? Thanks for stopping by, and please feel free to comment- so I know I’m not just talking to myself. Can I come too next year? Looks like an amazing place, and cheese too! [J] Odd, isn’t it, that it’s these lovely wintry scenes that make me long to go on a tour of the mainland. Summer doesn’t really do it for me. It’s the stately and big-house gardens and parklands that attract me! Thanks for the delights of your post. 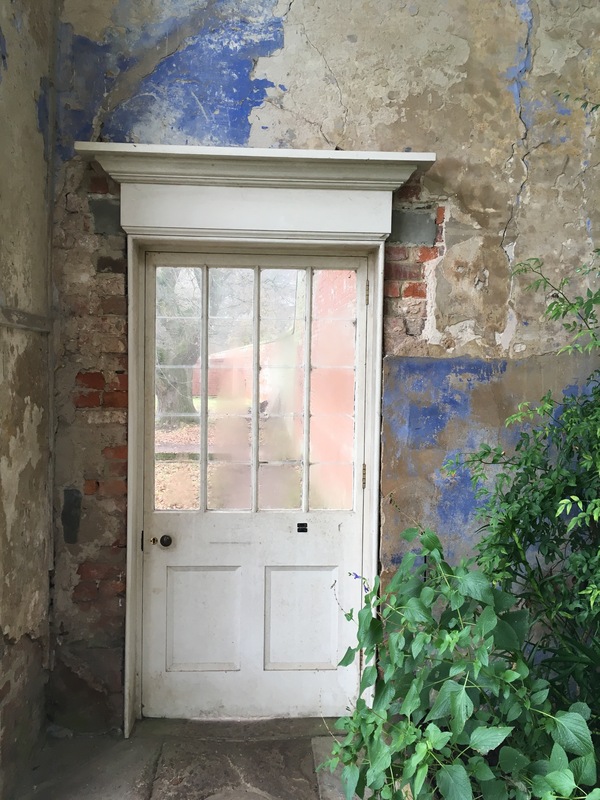 I especially love the pictures of the doors, and details of the walled garden. Thanks Jo for your lovely, kind comments. You MUST come next summer. And to NT Stoneywell, and Easton Walled gardens which are all nearby. A really enjoyable, and interesting, post with lovely pictures. I think that Heligan in Cornwall would be the garden I like to visit often. You’re welcome. I’ve only been a few times a long time ago, and like you it certainly impressed me. No worries if you don’t list it here. Lovely tour thanks. Now that blue paint isn’t that something. 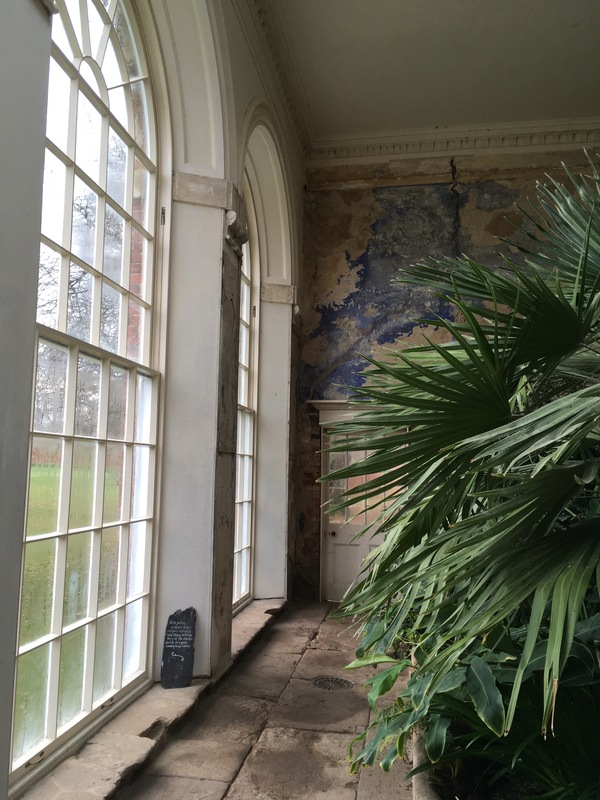 The pigment would have been mega expensive so interesting it’s in the peach house. I have never visited Calke but your pictures have made me want to!